Around our town the burgeoning sound of children’s protest and despair can be heard rising up toward the burnt July sky, as they realize that with the arrival of August, we are dangerously close to the first day of school, bearing down like a runaway freight train too close to stop before it smashes us. If the stewards of your school district also have decreed that summer ends mid-August, then you too have heard these sounds, the “why oh why’s” and the “woe is me’s” with which I fully concur; school should start in September. But the calendar is also why I have finally relaxed into the pace of unscheduled lazy summer days. I did not have either the foresight, spine, or budgetary willingness to sign my kids up for endless camps. So with me working from home, they were left to their own devices — really, they were left alone to interact only with their devices, if only I would leave them alone. You must know that means the first half of summer featured ample nagging on my part. (Me: “Go play!” Them: “We are playing!” Me: “I meant outside!” Them: “Where’s the extension cord?”) I kid. But with only two weeks left, I can let go! Now it’s not weeks of this conflict stretching before me, it’s mere days. So I surrender to days that have no goals or plans besides waking up and staying in pajamas until at long last someone must walk the dogs or go to the market because we are hungry. Days that are not filled with unique enriching activities, but if I’m lucky have been sprinkled with boogie boarding and soccer at the beach, water balloons or card games. And days that are filled with, yes, truly countless hours of xBox and YouTube videos. And I think, what was I so worried about? Will I remember to relax when next summer comes? For now, August is upon us. There are only two weeks left. Have a great summer. I come home from the market and see a purple foam sword lying on the just mowed lawn. It is a prop, along with an orange nerf gun, green ninja discus, and plastic machete, in a movie that four 11-year-old boys are making. I’m not sure what this flick is rated, but knowing one of the actor/writer/directors pretty well, I’d say it’s a safe bet that it’s PG for some violence. And, okay, mildly offensive language. And something about this makes my soul smile. A soul needs to smile. I don’t know if it’s real or it’s only my perception, but it seems that our younger son and his friends have a certain innocence and openness to imaginary play that had already been abandoned by his older brother and his peers at the same age. The older boys were all sports all the time at 11 years old, which can be wonderful, but that passion can lend itself to trash talk and alpha male preening, in some instances. Give me sword-fighting and pratt falls any day. Meanwhile on the lawn, the boy holding the camera calls action. Another boy aims a nerf bow and arrow, and releases its projectile toward a third boy. “You missed!” the target says. They fall down laughing. It is May already. Next month these boys will graduate from elementary school, and two months later they will enter middle school. I know things will change. I’m not naive. I pray for them to maintain enough innocence that they will still make movies, that nerf guns and green frisbees will still unleash their imaginations, that they will still play together unselfconsciously on a perfect spring afternoon, and that the only “drama” will be the storylines they create for the big screen. Watching dailies of their scene. I came across author Susie Orman Schnall as I browsed the Penn Alumni magazine section looking for my update about publishing a novel. I was sandwiched between two other announcements of novels being published — before mine was classmate Cheryl Della Pietra announcing publication of her novel, Gonzo Girl. 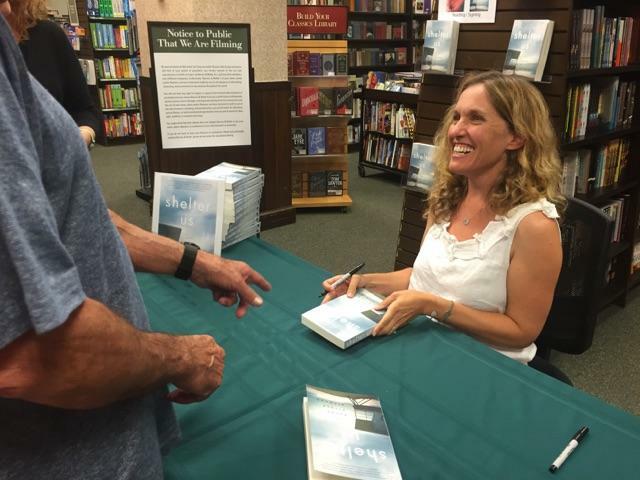 After mine was Susie announcing publication of her second novel, The Balance Project. The novel emerged from an interview series of the same name. The Balance Project is “a series of relevant and refreshingly candid interviews with inspiring and accomplished women talking about balance.” Susie has just published interview No. 148 (mine). What prompted her quest to understand the notion of balance in women’s lives? I recommend you skim the list of interviews and read a few — who interests you? A writer? A chef? A fashion designer? A journalist? They’re in there. I have a feeling you’ll want to spend some time with these interviews, browsing, recognizing parts of yourself, wondering about paths not taken and paths you might yet take, remembering that this business of living can be thrilling, overwhelming, satisfying, crazy-making, enervating and energizing — and that we’re all doing the best we can. The interviews are fun peeks into alternate lives, and above all else, reminders that none of us is in this alone. We drove to Mammoth to celebrate my firstborn’s birthday: 15. FIFTEEN. To you that may sound little, depending on your point of view, but indulge me. It’s as big as he’s ever been. The weather conspired against us. It will snow all day, both days, with 50 mph winds. Lucky me, I’d decided in advance that I wasn’t skiing this time. It’s not my cup of cocoa, let’s say; I am preoccupied with falling, even before I put my boots on. My job today is ski support from the comfort of the lodge, writing and reading contentedly. Family bonus: I spare my husband having to worry about me while keeping track of the kids, too. It’s not about the skiing, anyway, our trip. It’s about board games. It’s about meals together, and movies in the room. It’s even about the travel days, together in a car driving through California’s desert-to-mountain landscape. It’s the offhand conversations, singing with the radio, brothers watching TV shows sharing an iPad… and no fighting all day?! This is the good stuff. This is the good stuff. Did I mention 15? At this moment I am sitting in the lodge looking out at near white-out conditions. My feet are cold despite two pairs of socks and boots. I’m supposed to be working on Novel 2. I’m in the first draft. I feel like I’m still learning how to write — in a good way — and hope to always feel that way. 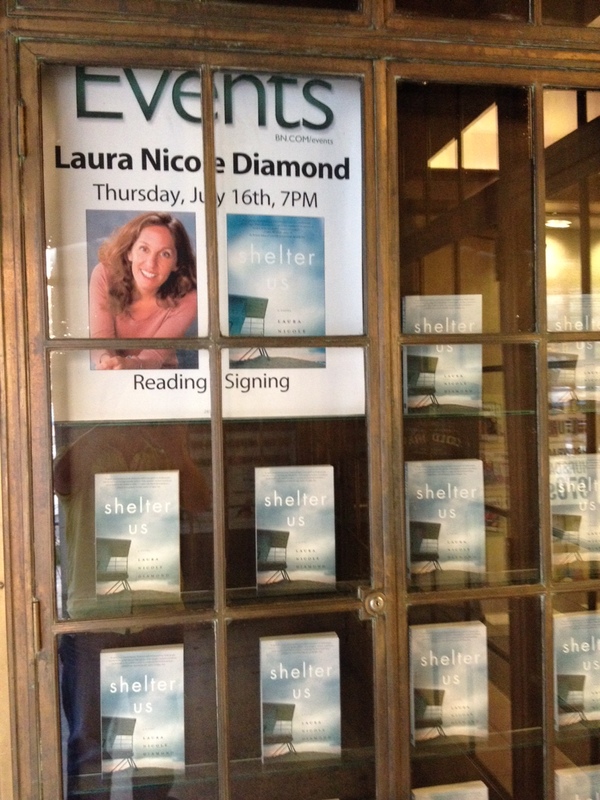 Bits of positive feedback for Shelter Us still trickles in, which feeds my determination to keep on writing. Like yesterday, I received an e-mail from a fellow She Writes Press author, Barbara Stark-Nemon, who had just read it and kindly shared with me the review she’d posted on Amazon and Goodreads. It began with a quote that I thought sounded so beautiful and then I realized, happily and with surprise, Duh, she’s quoting ME. I didn’t recognize my own words. My sentences took on their own life, they were not part of me anymore. They grew from me but became themselves. I glance up and outside to the mountain. The glare is bright and my eyes take a moment to adjust. There’s the ski lift, there’s a tree, there’s the snow blowing across the sky. A faint body moves against the mountain through that snowy haze. I can’t see my boys, but I know they are out there, separate from me and gloriously growing into themselves, swooshing or falling all on their own. When I was a student at Penn, most of my activities were limited to a square 1/2 mile of its West Philly campus — classes, rehearsals, libraries, parties. Occasionally I ventured downtown. There was the (impressive but ineffective) rally for Michael Dukakis in front of City Hall. There was my weekly SEPTA ride to an internship at the Women’s Law Project. And there was lovely, leafy Rittenhouse Square, an area I had no particular business in, but which appealed to my west coast eyes and ears with its older, sophisticated sensibility. 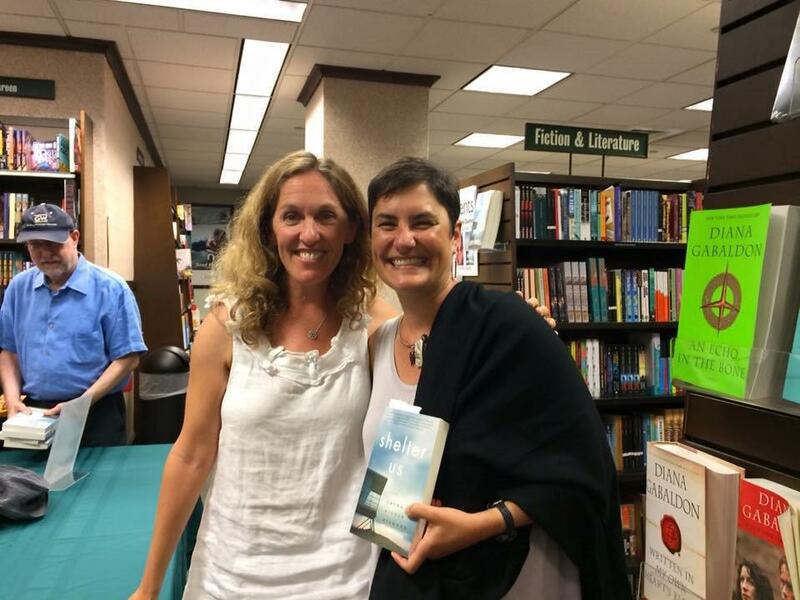 Flash forward (ahem) years to 2015, and I walked up to the Barnes & Noble in Rittenhouse Square to see its window filled with my first novel. It’s hard to put that feeling into words. I’ll try, and then I’ll let the pictures tell the tale. When I graduated from Penn and returned home to Los Angeles, I could not have known that some day I would marry a boy from Pennsylvania, that his family would become my extended family, and that they would be some of my biggest supporters. Time passes so swiftly that I can sometimes forget I’m not a “newcomer” still, that I’ve known them nearly 19 years. …and PR maven and super cousin Hope Horwitz of SFPR. Suzanne Myers from Jewish Family & Children’s Service of Philadelphia joined us, accepting a donation to the agency from book sales that evening. Rabbi Deborah Waxman, President of the Reconstructionist Rabbinic College, was in attendance! 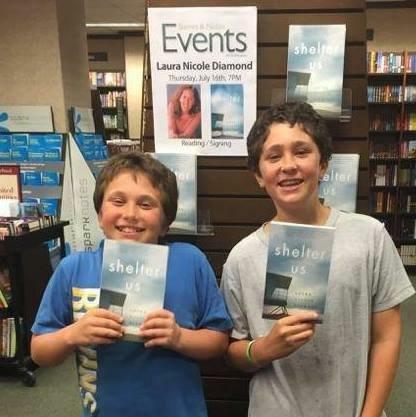 I talked about the connections between Shelter Us and the values Jewish Family & Children’s Services represents, helping others, welcoming the stranger. One woman pointed out that being “a stranger” does not always refer to the stereotypical outsider I’d referred to — a homeless person, an immigrant — and that money can mask stranger status. She choked up. I did, too. I kinda see my Dad’s face in my expression. Yes, I answered. Doubt abounds. But when the time came to finish, I had to let it be. I hope I modeled something for him and his brother. To follow elusive dreams. To celebrate achievements. And to be grateful for the people who celebrate with you. Thank you, thank you, one and all. It may have been the glass of red wine with dinner. Or the 3-hour time change. Or my mother’s delicate snoring in the bed next to mine in our hotel, that kept me awake our first night in New York. Yet, as I pulled the pillow over my head, planning a Duane Reade earplugs run, I was grateful to be able to hear that sound, to sleep near my mother, still. Our reason for being here: the Jewish Book Council (JBC) and its author networking conference, aka the “Pitchfest.” In those wakeful midnight hours, I ran over and over my two-minute pitch. You get two minutes. Two minutes to summarize seven years of writing, revising, abandoning, and returning to a manuscript that represents your most personal ideas and emotions. You sit in a filled-to-capacity sanctuary (thinking everyone here wrote a book, too?? ), waiting for your turn to tell the savvy book festival planners from around the country why they must choose your book for their communities. And you pinch yourself because you’re one of the authors, and everyone in this room loves books as much as you do. When it was my turn, I left my written notes on my chair, I looked out at the audience, remembered that they wanted me to nail it, and took a breath. I talked to them like I was talking to my mom, telling them about my labor of love. And instead of two minutes it happened during a single encapsulated, time-not-passing, bubble of a moment. One of the most beautiful commandments in our tradition is to take care of the stranger – the vulnerable and powerless. This always resonated with me, but even more so after I became a mom. I began to see everyone – even a homeless person on the sidewalk – as someone’s child. But like many people, I struggle with wanting to help and not knowing how. 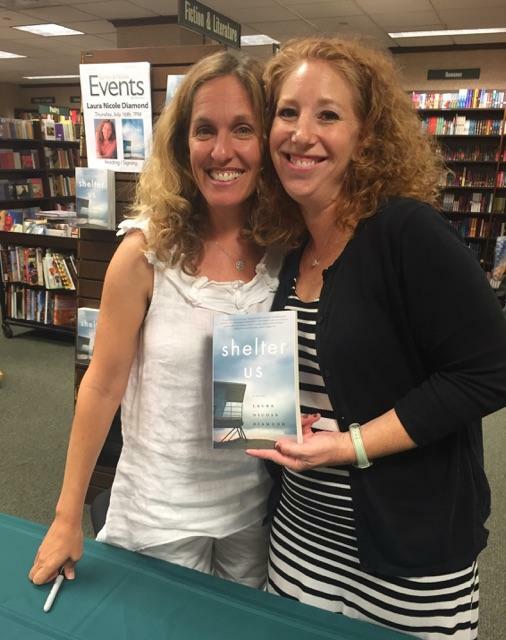 In my novel Shelter Us, Sarah, a mother of two who is grieving the death of an infant, sees a young homeless mother and child, and she can’t stop thinking about them. Remembering her late mother’s many examples of caring for “the stranger,” moves her to reach beyond her comfort zone and try to help them. Writing about Sarah’s journey allowed me to explore the difficult question of how we respond to the need we see every day. But even more, it was my way of wrestling with a mother’s universal fear that the worst could happen to her child. Sarah, who suffered that loss, sings a Hashkivenu prayer to her children at bedtime, asking for God’s sheltering arms to keep them safe. The song she sings, “Shelter Us,” I first heard at Jewish summer camp, and its primal yearning has stayed with me all these years. Who are today’s strangers and what are our responsibilities to them as Jews? Can helping others heal our own wounds? What are the values we want to pass to our children, and how do we communicate them? In what ways did Torah study impact my thinking and writing? How do we move beyond our fears, to savor the small, beautiful moments of parenthood that are all too fleeting? And then it was the next author’s turn. As soon as I sat down I was thinking of what I’d wished I’d said: This book has great blurbs by brilliant bestselling authors! Library Journal recommends it for book clubs! You’re gonna love it! You’re absolutely gonna love it! But, like life, there are no do-overs. There are words you will wish you didn’t leave unsaid. My mom is sitting behind me as I write these words to you, and she’s about to leave to spend a day in the city with cousins, while I go do more book stuff. “Mom,” I call out before she leaves. “I have to tell you something!” She stops, a look of concern floats across her face. And I try to tell her what she means to me.